Valkla is located about 40 km from Tallinn. In Valkla seaside centre you can kayak, participate in a rally with a raft, rent a SUP-board and take part in various water and speed boat activities. 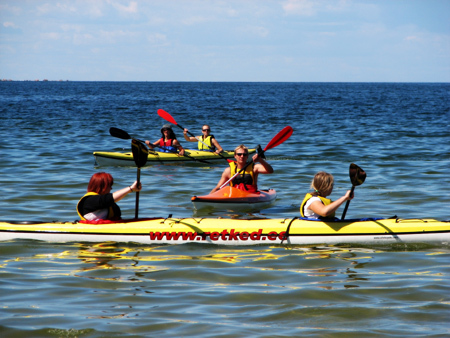 You can join a sea-kayking trip to Pedassaar island from the centre in case you ordr it in advance (+3725114099). In July the sunset sea- kayaking trips will start at 6 pm to Pedassaar island and starting from the 1st of August they will take place at 7 pm. Please inform us about your wish to participate by calling +372 5114099. It costs 30 eur per person. The minimum price is 120 eur or four participants. Regular trips take place on Thursdays, in July starting at 7 pm and in August starting at 6 pm. Advance booking is necessary.